Nearly 200 national governments have committed to make cuts in greenhouse gas emissions in an ambitious global deal. But the task will in many ways fall to cities, states and provinces. The term “subnational” appears six times in the 32-page text (compared to none in the 1998 Kyoto Protocol). How did this shift evolve, and what is its implication for converting a landmark aspirational agreement into difficult-to-achieve emission reductions? When climate change first emerged on the international agenda, the 1987 Montreal Protocol for protecting the ozone layer was the model for responding. It was a centralized regime that focused on national governments cooperating to address a common problem. This model, however, has proven unsuitable in addressing climate change. To curb ozone-depleting chemicals, the Montreal Protocol focused on a small number of developed countries, a small number of multinational corporations and a narrow range of actions. Climate change is vastly more complicated, with drivers on every level from local to global, and as result, little effective international action has emerged. In this vacuum, subnational governments and civic society actors have begun responding to the threats of climate change, and seizing the economic opportunities in moving toward clean energy, whether or not action takes place on the international stage. Researchers are finding that in the last decade the “evolving reality of climate change policy development, in the U.S. and abroad, relies heavily on sub-national initiative.” Even national agencies like the U.S. EPA and international efforts like the latest Intergovernmental Panel on Climate Change (IPCC) report consider subnational actions critical components for future national and international action. 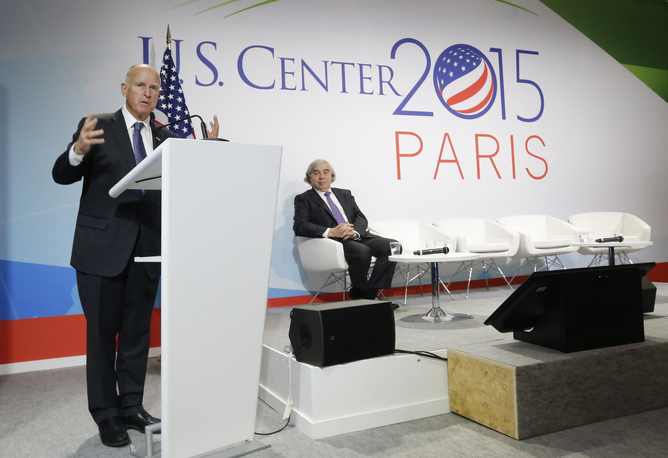 Cities, states and provinces have become dynamic laboratories for climate change policy. They’ve experimented with carbon taxes, rebates, cap-and-trade programs, building codes, financing mechanisms, private-public partnerships, innovation incubators, university-government partnerships and streamlined permitting for renewable energy projects. These “subnational authorities” demonstrate that climate policy can reap environmental benefits in the form of greenhouse gas (GHG) emission reductions. Perhaps more important, however, is that for many subnational governments, aggressive clean energy policies deliver substantial economic benefits in the form of reduced energy costs, less energy price volatility, job growth, keeping energy dollars local and greater energy security. In fact, the large portfolio of subnational policy experiments sparked the private sector, from multinationals to start-ups to innovate technologies, as well as delivery, marketing, deployment and financing of them. In the U.S. Northeast, both Democratic and Republican governors initiated the Regional Greenhouse Gas Initiative (RGGI), a voluntary compact and the first North American cap-and-trade program. The region set a “cap” – a limit on the total amount that all power plants can emit each year (91 million tons). Then it created a carbon market in which carbon allowances could be “traded.” The less a power company emits, the fewer allowances it needs, so it has an incentive to be more efficient. As the cap is lowered over time, overall, the energy market is driven to pollute less and creates economic advantages for clean-energy innovation. 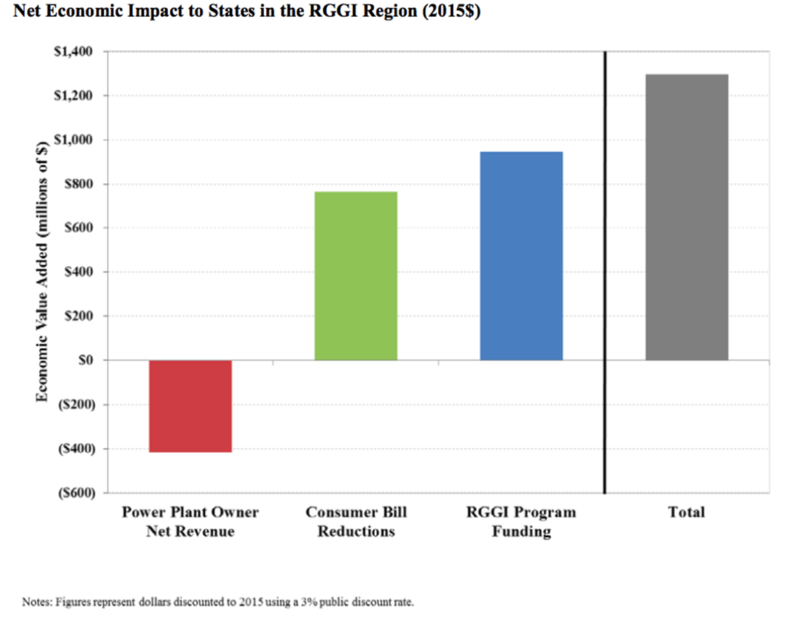 During its two three-year compliance periods (2009-2011 and 2012-2014), RGGI contributed to economic growth in the region, generating net economic benefits of over US$1 billion during each three-year period (not counting avoided costs of climate impacts), according to one analysis. Each of the RGGI member states (and cities within those states), also instituted a range of targeted policies that played to the strengths in those states. 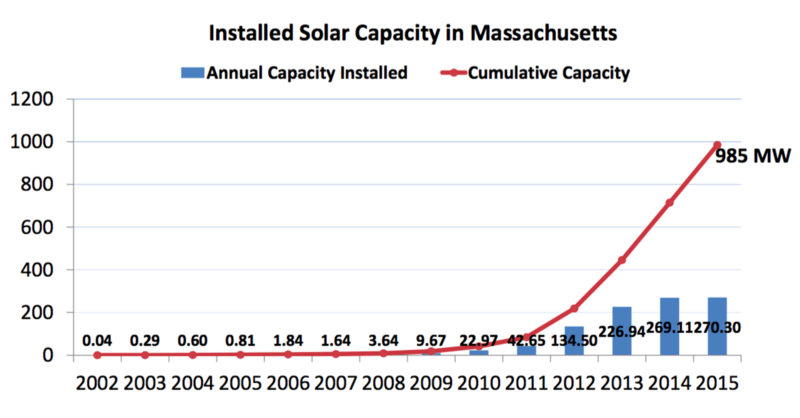 From 2007 through 2014, Massachusetts passed a series of laws and crafted regulations that created incentives for utilities to improve energy efficiency and for electricity customers to use renewables like solar energy. For example, generous solar energy rates were available to customers which, when combined with innovative financing, allowed customers to reduce upfront installation costs. Installed solar capacity grew has grown from about 3 megawatts (MW) in 2008 to 985MW in 2015. Energy efficiency programs in Massachusetts deliver savings of over $2 billion per year (in net present value)). 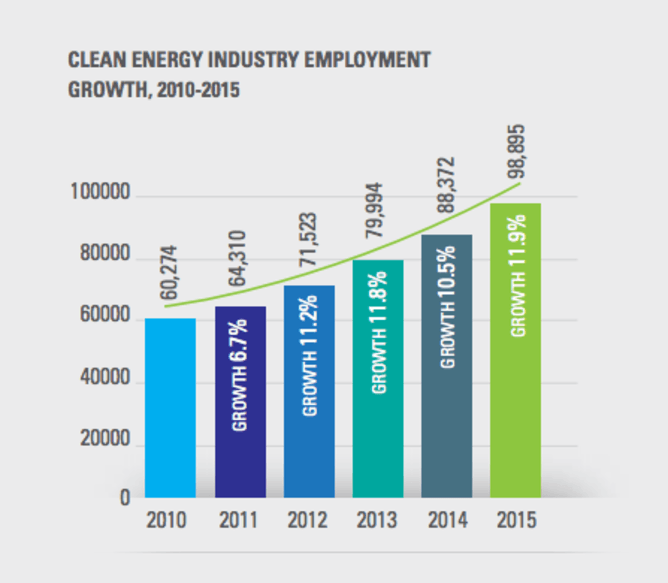 Clean energy sector job growth has increased by more than 10 percent per year for the last four years. At the same time, greenhouse gas emissions in Massachusetts decreased by 15 percent between 1990 and 2011. 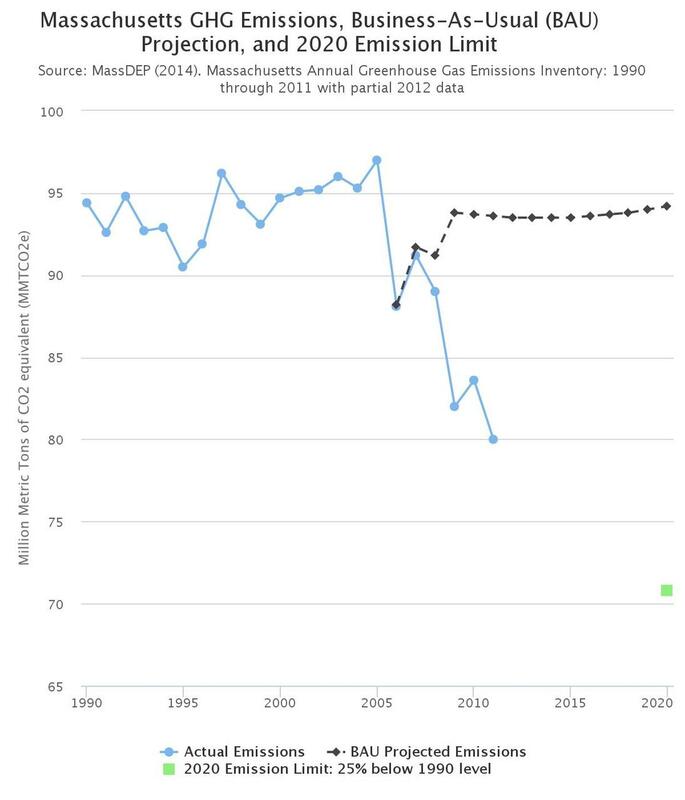 This Massachusetts story is not the only example of states and cities that have instituted integrated policies that have driven clean energy growth. California is another classic example of a state that has created success in solar, wind, energy efficiency and electric vehicles. Germany, Spain and Denmark are countries that have instituted federal initiatives through local actions that have resulted in large-scale deployment of wind and solar. Throughout India, federal and state policies are seeking to drive rapid adoption of renewables. Tanzania in East Africa and the Economic Community of West African States (ECOWAS) in West Africa are in the midst of regulatory reforms that are designed to incentive distributed solar and wind energy. The Paris Agreement was a game-changer, aligning countries in a way that had not been accomplished before. This included a traditional horizontal alignment across countries and also a novel call for an alignment from global to local levels. But coordinating regional or local action with international agreements is complex. In the United States alone, there are over 3,000 energy utilities governed by local, state and federal law. Countless authorities govern transportation decisions. Manufacturing activities routinely cross borders and levels. Getting 196 countries to agree in Paris will be easy compared to assuring that all those activities (and those in Gujarat state in India, and Guangdong province in China, and Dar es Salaam, Tanzania, and Sao Paulo, Brazil) are governed in ways that align with a new global covenant to move to a clean energy future. But subnationals, in developed and developing countries, have demonstrated that suites of policies can effectively “mobilize stronger and more ambitious climate action,” as the Paris Agreement calls for. Paris gives a tailwind to push these efforts more quickly and more broadly. It also gives a new immediacy to the familiar admonition: “think globally, act locally.” The agreement creates a strong signal for subnationals to redouble their efforts. And they must, for Paris will only succeed if they do. David Cash, Dean, John W. McCormack Graduate School of Policy and Global Studies, University of Massachusetts Boston. This article was originally published on The Conversation. Read the original article.